The peaceful islands of Sarasa Land have been invaded! Tatanga the spaceman has hypnotised the inhabitants and kidnapped Princess Daisy. Mario discovers their plight and sets off to stop Tatanga and rescue Daisy. Each kingdom of Sarasa Land is made up of three stages. Run and jump through each stage and reach the goal at the end. At the end of each world you have to defeat a boss. 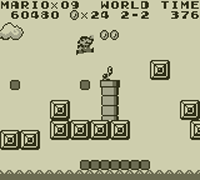 Mario can collect power-ups to improve his abilities and on special stages he rides the Marine Pop, a missile-shooting submarine, and the Sky Pop, a biplane.